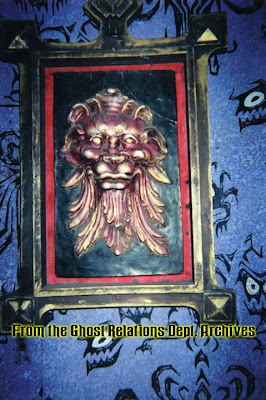 The Ghost Relations Department: What a Relief! Just days after the Disneyland Haunted Mansion's 39th Anniversary, I bring you a fresh Disneyland Mansion post! 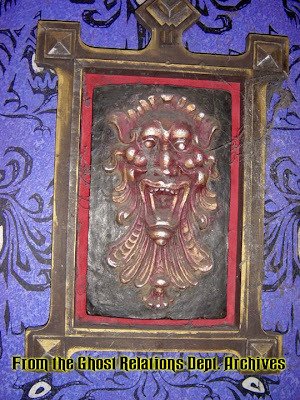 In the Corridor of Doors at Disneyland, there are all of the framed ghoul portraits and the Ghost Host painting. These were original even in 1969. In the 1990's there was a rehab, restoring the Ghost Host painting, adding a few new ghouls, including a pen drawing of a new ghoul drawn by Steve Fink, and then two other new faces. On the right wall near the Ghost Host painting are two relief sculptures, also created by Steve Fink. One is of a pleasant smiling beast creature, while the other is of a similar creature, snarling in anger. Wow, those are very cool and unusual! Thanks for the pictures! Great Post! I only recently found your blog, but in the last few days I've read every single one of your posts! Great job, and keep up the good work! !